JIPMER MBBS rank letter 2018 has been made available on 12 June at 11:00 am by JIPMER, Puducherry. Candidates who are included in the merit list can download JIPMER MBBS rank letter. To download JIPMER MBBS rank letter, aspirants need to enter their User ID and password in the login window. 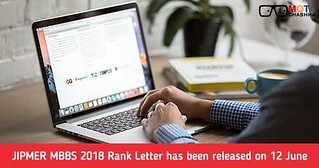 The link to download the rank letter of JIPMER 2018 is available on this page. The rank letter provides the rank, total and section-wise percentile scores of qualified candidates. A printout of JIPMER MBBS 2018 rank letter must be taken for the counselling process. The counselling of JIPMER MBBS 2018 will be done from 26 June. How to download JIPMER MBBS 2018 Rank Letter? The procedure to check the rank letter of JIPMER MBBS 2018 is mentioned below. Aspirants who will download JIPMER MBBS rank letter 2018 will be allowed to appear for the counselling process. JIPMER MBBS Counselling procedure will commence from 27 June. Eligible candidates are required to report at the JIPMER MBBS counselling venue as per the schedule with the relevant documents. JIPMER MBBS 2018 counselling round 1 will be organized from 27 to 29 June. The seat allotment of JIPMER MBBS 2018 will be done on the basis of rank, preferences of colleges as well as courses and seats available. JIPMER MBBS 2018 is the basis for admission to 200 MBBS (150 Puducherry, 50 Karaikal campuses) seats.